The conversation about the candidates in social media from August 27-October 21 differed significantly from mainstream media coverage of the campaign. For the most part, the conversations on Twitter, Facebook and blogs about the candidates were relentlessly negative. And though the volume of social media assertions, particularly on Twitter and Facebook, swells in response to major events-such as conventions and debates-the tone of that conversation does not change accordingly. On blogs, there is somewhat more sensitivity and reactivity in tone to significant developments, but not as much as in mainstream media. 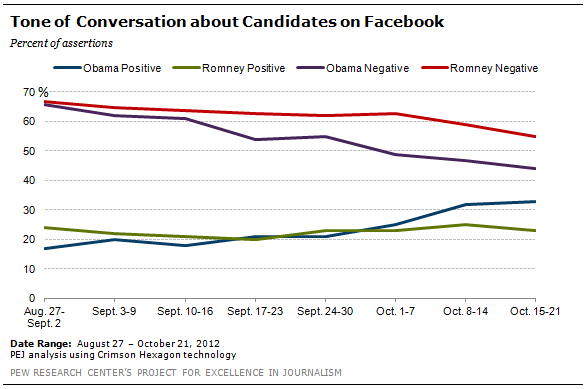 Across the three major social media platforms, neither candidate enjoyed a single week of more positive than negative conversation. Within that, Twitter users consistently treated Obama somewhat more favorably than Romney; the conversation among bloggers and on Facebook was more divided in tone between the two contenders. The Twitter conversation about Mitt Romney has been very tough; In each of the eight weeks studied, negative sentiment outstripped positive sentiment by anywhere from 38 to 49 points. In none of those weeks did positive Twitter assertions about Mitt Romney ever top 19%. His best week, interestingly, included the week of Democratic National Convention, when he received more positive treatment (19%) than during the week of his own convention in Tampa (17%). Overall percentages of positive conversation on Twitter for Romney varied only minimally from week to week: from a low of 13% (Sept 24-30) to 19% (Sept 3-9). In the last month (September 24-October 21), positive tweets about Romney have risen by one percentage point every week. Negative Twitter sentiment for Romney made up the majority of conversation about him each week, ranging from 53% on the low end to 63% on the high. As one measure of how little the tone of the conversation in the Twitter universe seems to be swayed by real-time events, the week of September 17-23 when the now infamous 47% video was released, 62% of the conversation about Romney was negative-only marginally more negative than the conversation during the week of the Republican Convention (59%). Obama received generally more positive treatment on Twitter, although his numbers have fluctuated more widely than Romney’s from week to week. In each of the weeks studied, Obama’s percentage of positive tweets has been consistently higher than Romney’s-by margins of anywhere between 1 to 13 points. Twitter sentiment about the president is also notably less negative than Romney’s. Between August 27 and October 21, Obama’s positives have ranged from a low of 14% (September 24-30) to a high of 31% (September 3-9, the week of the Democratic convention). Unlike Romney, Obama’s negatives have remained well below 50%, with only one exception (October 8-14, the week of the vice-presidential debate). Again, as an example of how Twitter users reach different conclusions than the mainstream press, the percentages of positive assertions about Obama were nearly identical during the weeks of the first two debates (27% vs. 25%) despite the fact that most polls showed that Romney won that encounter by a wide margin and Obama won the second by a more modest margin. An examination of the random sample of publicly available posts on Facebook finds that the narrative for both men gradually improved over the course of the eight weeks studied-even as neither man enjoyed a single week of more positive than negative coverage. But that improvement was considerably more dramatic for Obama than Romney. Both candidates began the convention period with negative assertions on Facebook outstripping positive ones by more than 40 points. Starting in late September, Romney saw modest improvement; he enjoyed his best week (when positive exceeded negative by 32 points) from October 15-21. The uptick in the tone of the conversation about Obama began in mid-September and he also enjoyed his best week (with negative assertions surpassing positive by 11 points) from October 15-21. Aside from faring better in the overall narrative in recent weeks, Obama has consistently been the subject of more of the conversation about candidates in Facebook, topping Romney in each of the eight weeks studied. By way of example, during the week of the Republican convention, there were still more Facebook assertions about Obama (83,636) than Romney (70,828). The following week, when Democrats gathered in North Carolina, the president was the subject of almost 115,000 more assertions than his challenger. The most intense Facebook conversation about the campaign occurred during the week of the October 3 presidential debate in Denver. But here too, Obama-who was widely perceived to have lost that debate-received more attention (270,051 assertions) than Romney (242,138). The overall tone of the conversation on blogs for both of the candidates was sharply negative, only just somewhat less so than on Facebook and Twitter. Over the eight weeks studied, the positive tone for Romney ranged only between 12-22%, and Obama’s similarly ranged between 15-22%. Negative tone for both was over 40% in almost every week. Over time, however, there were somewhat opposite trajectories for Romney and Obama. Unlike on Twitter, the first debate may have been seen on blogs as changing the dynamics of the race. For example, the tone of the positive conversation about Romney during the first five weeks (August 27-September 30) trended steadily downward, with the gap between negative and positive coverage expanding from 22 points during the Republican convention week to 45 points in the last week of the month. But in the first three weeks of October, starting with the Denver debate, that gap narrowed considerably, reaching its smallest point (15 points) from October 15-21. The trajectory of the conversation about Obama is less fluid and more a zigzag pattern. 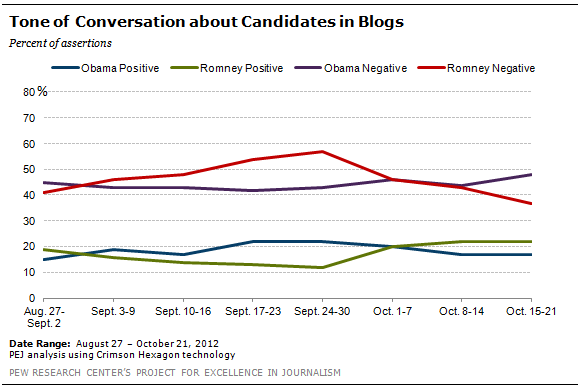 The gap between his negative and positive coverage was on a modest downward trend until the week of the first debate. Since then, it has grown again, so that the gap (31 points), the week of October 15-21, is back to where it was during the week of the Republican convention (30 points), the first week studied in this report. As was the case on Facebook, blogger assertions about Obama exceeded those about Romney every week from August 27-October 21. The study of the conversation about the candidates in social media does not include the more refined breakdown of tone by theme of campaign coverage that was examined in the mainstream media sample. Frame: Which Aspects of the Race Got Attention, and Which Ones Didn't?